As we age, facial wrinkles and creases become more prominent. The face also loses its fullness with increasing age. Based on research, the loss of facial fat is a very significant component of facial aging. When the layer of fat beneath our facial skin begins to thin, the volume loss contributes to hollows and contour changes, especially around the eyes. The deflated appearance due to loss of facial fat makes the face look older and more tired. Fat transfer is also called micro-lipo injection or autologous fat transplantation. 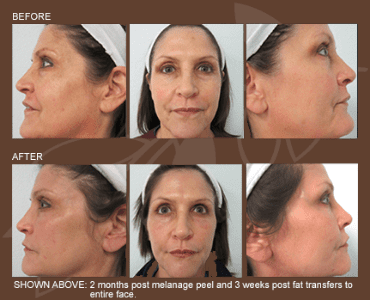 This cosmetic procedure improves the fullness of facial features with a patient’s own fat. Fat transfer is a popular alternative to treatments for wrinkles. Fat transfer is designed to re-contour your face and can provide definition to your cheeks and chin. It can be used to correct skin deformities such as deep furrows, facial wrinkles and other depressions on other body areas such as hands. Hollow areas under the eyes and temple area can also be treated with fat implantation. Since this treatment uses your own fat cell, allergic or rejection reactions will not occur. What Are The Benefits of Fat Transfers? Autologous fat transfer offers several major benefits. Aside from improving the appearance of the aging face, autologous fat transfer is natural. The material used is not from animals or synthetic products. The fat can be used to correct facial skin imperfections, which include scars and depressions; it is also an excellent complement to facial resurfacing treatments. Fat injections last significantly longer than other injectable cosmetic products. Who is a good candidate for fat transfer? 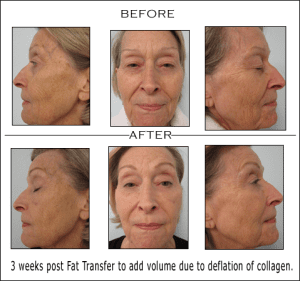 Adults who would like to have a younger looking face by reducing or eliminating the appearance of creases, wrinkles, furrows, smile lines, hollow depressions in the face are ideal candidates for fat transfer. Patients who have lipoatrophy, a condition characterized by the loss of the layer of fat in the face that forms the contours of the cheeks and jawline can also benefit from fat implantation. During the initial consultation, a full health history is taken. Certain medications such as blood thinners, birth control pills, aspirin, Vitamin E or anti-inflammatory drugs will be avoided several weeks prior to procedure. How Is Autologous Fat Transfer Done? The cosmetic surgeon selects a donor site on a person’s body and tumescent infiltration is done to locally numb this area. Mild oral or IV sedation is used to make the experience comfortable and pain-free. Once the donor site if numbed under local anesthesia, micro-cannula liposuction is performed to obtain the autologous fat. A special filtration system is used to harvest the richest fat and is then prepared using the donor’s PRP (platelet rich plasma). The area receiving the fat is then numbed using local and topical anesthesia. Swelling and bruising are normal due to the implantation process. Every person is different in the time is will take for swelling and bruising to subside. Cold facial masks are worn to minimize these common side effects. Anti-inflammatory medications will also aid in the recovery. Make-up can be worn to cover any areas of bruising. If full area liposuction is already being performed, fat transfers will add an additional 1500.00 to the procedure.